Does race have a place in the Big Society? On the 30th anniversary of the first Brixton Riot, we ask: Does Race Have A Place In The Big Society? We know that cuts to public sector services and jobs will impact particularly heavily on ethnic minority people. Meanwhile the organisations that fight for racial equality in our society are to lose financial support, leading to doors being permanently shut. So we ask: how can the Big Society be a racially just one? We believe that there are opportunities for us to make sure that it is. But to keep race equality on the agenda will mean finding new ways to approach the same problems and, perhaps, learning from societies elsewhere. That is why we will screen Number Games, a short documentary exploring how Big Society ideas have already played out in the US, on Monday 11 April 2011. The film premiere, held at the Channel Four Building, will mark 30 years since the first Brixton Riot in 1981: a watershed moment in the history of race relations in the UK. The 25-minute film, which is the brainchild of leading race equality think tank the Runnymede Trust and independent filmmakers Feedback Films, explores how we can ensure that the Big Society is also a racially just one. Set in London and Chicago, the documentary follows Runnymede director Dr Rob Berkeley as he travels to the US for the largest race equality event in the world. Rob speaks in particular to community organisers, learning how their brand of activism has been used to fight for racial justice. The film follows the progress of community organising group Action Now as they support local resident Tanya Richards, whose home is under threat of repossession. Community organising has a big following in the US and has been used to effect change on issues large and small. This type of proactive, volunteer-based citizen involvement fits perfectly with the Big Society paradigm. But can community organising really achieve change? And how does race equality fit in? Big Society policies, which are yet to be wholly implemented in the UK, already have real world equivalents in America that have been in practice for decades. The premise of free schools, for example, is not dissimilar from that of Charter Schools, of which there are already thousands in the US. Chicago, the country’s second largest city, is also recognised as its most racially segregated. People in Chicago have been living with Big Society policies, such as low government expenditure in public services, publicly elected police commissioners and greater reliance on voluntary sector organisations, for years. How has this shaped their communities and what can we learn from their experience? Number Games tackles these questions head on and looks at positive ways – devastating funding cuts notwithstanding – for us to move the struggle for race equality onwards. Why must we continue to find new ways to achieve racial equality in the UK? 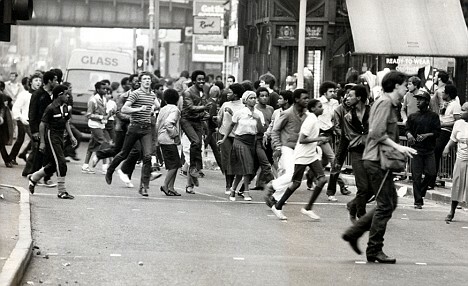 This entry was posted in National News and tagged Action Now, Brixton Riot in 1981, Does race have a place in the Big Society?, New Economics Foundation, Number Games, cuts to public sector services and jobs will impact particularly heavily on ethnic minority people, fight for racial equality. Bookmark the permalink.